Toto je druhá kompilacce oblíbeného tréninkového programu pro studium všech částí šachové hry: zahájení, střední hra, koncovky. Encyclopedia of Middlegame, Vol. II – the program for studying middlegame opening plans and playing techniques. Theoretical section includes over 600 games/lectures, each of them illustrating the popular openings' typical plans and methods. Special training section with more than 500 exercises for a user to solve as well as 150 training positions. Course composed by GM Kalinin. Chess Tactics for intermediate players – the program including over 1180 tactical exercises, classified by themes and difficulty. Mate Studies – about 5000 exercises and problems. An excellent program for developing your combinative skills! Theory and Practice of Chess Endings – the best program for studying endgame! Its author, the well-known coach GM Panchenko, worked on the chess material for over 20 years. Many experts regard his endgame handbook as the best in this field. Thousands of chess players in Russia used it to study the endgame and many of them are now grandmasters. Theoretical section includes as many as 700 lectures. Training section with 300 exercises as well as 180 examples. Chess Endgame Training – the program consists of more than 2450 endgame exercises taken out of practical games, endgame studies as well as training examples, all classified according to no less than 500 endgame themes. System requirements: IBM-compatible PC, 32 Mb RAM, hard disk 100Mb, Windows 95/98/2000/NT/XP/Vista, CD-ROM drive. No additional software required. 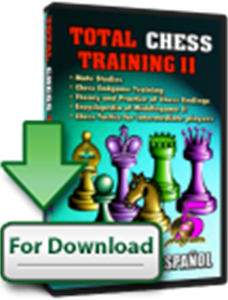 Total Chess Training II includes more than 11,000 study examples and exercises for chess players with the ELO rating from 1700 to 2400! Tento kurz obsahuje více než 700 her/lekcí kde každá z nich ilustruje teoretické a praktické metody koncovek. Toto je druhá kompilace oblíbeného programu pro studium všech částí šachové hry: zahájení, střední hra, koncovky. Tato třetí kompilace populárního tréninkového prohramu na 5 CD pokrývá tuto šachvou tématiku: Taktiku, Kombinaci, Strategii a Střední hru. Tato třetí kompilace oblíbeného tréninového šachového programu na 5 CD pokrývá tuto šachovou tématiku: Taktika, Kombinace, Strategie a Střední hra. Total Chess Training IV se skádá z pěti výborných šachových vzdělávacích programů a pokrývá tyto apekty šachové hry jako je Zahájení, Kombinace, Útok a Obrana. Tento baíček obsahuje téměř 50,000 pozic s obtížností 1300 až 2000 ELO.